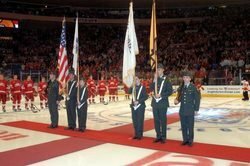 Alex Bohn ’09, Sara Clarke ’11, and Aaron Furtner ’10 were members of the six-cadet Army ROTC color guard that presented the colors before a sold-out hockey crowd in Madison Square Garden in November. Army Second Lieutenant Timothy Blair, a resident of Lutz, Fla., and an Ithaca College graduate, received the Bronze Star Medal with Valor for the heroism he displayed as an Airborne Ranger platoon leader in Iraq. When awarded for bravery, the Bronze Star Medal with Valor is the fourth-highest combat award of the U.S. Armed Forces, behind the Medal of Honor, Distinguished Service Cross, and the Silver Star. For Bohn, a business administration major, joining was all about the experience. “Hopefully, I’ll get lots of leadership experience. Officership looks good on the résumé,” he says. Bohn’s participation in ROTC will allow him to enter the Army with the rank of second lieutenant. For Murray, a history major, it was about the call of duty. “While different people in the United States just complain about the condition of the Iraqi and Afghan people, I will be in a position to actually help them,” he says. Many students have some misconceptions about the day-to-day life of ROTC-affiliated students. 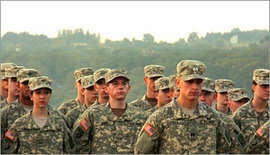 The Cornell Army ROTC (of which Ithaca College is an affiliated extension school) has physical training three times a week for an hour. This training, Bohn points out, is not like the boot camp depicted on television. Most training activities, such as running and weight training, are pretty standard. But what else do they get? “I have a guaranteed job after college. All my friends are going to be fiddling with their résumés, and I’ll get $49,500 a year with benefits in the Army,” Bohn points out. Although neither Murray nor Bohn has decided to make the Army a lifelong career, both believe they are receiving valuable training as ROTC members. Murray in particular plans to use his Army training to find a job as a contractor or with the government directly. “But that isn’t my primary motivation for joining ROTC,” he says, placing much more emphasis on the personal development he receives. The Army’s commercials claim that serving in the Army changes you for the better. Murray believes it’s all about responsibility, and Bohn agrees. “ROTC is a leadership program. It develops you; it turns you into something productive, inside and out,” Bohn says. In response to the first comment. Go to hell. I am not some sort of nameless faceless drone and chances are i come from a much poorer background then you. The military is a vehicle of upward social mobility. Many people could not attend college without the money given from the military and the discipline gained from their experiences helps them to graduate. So it covers both your goal of mitigating poverty and fills a role that is necesary to every country. Also it looks like you've already been brainwashed. the only reason you state for being anti military is that it takes money away from social projects.